I wrote in an earlier post about audio books being one of my homeschool secret-weapons. 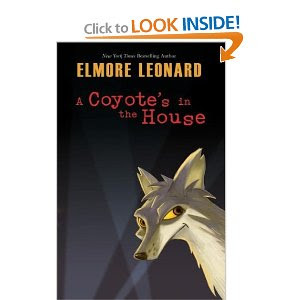 In this post, I would like to share one of our all-time favorite audio stories, A Coyote's in the House by Elmore Leonard. Read superbly by Neil Patrick Harris- (really, I could go on and on about what a splendid job he did with this..) this is the story of Antwan, hip & wild Hollywood coyote- living the good life in the Hollywood hills, content to dine on left-overs scrounged outside movie-star homes, watching movies at the drive-in and through windows of homes, enjoying the wild/free life of living coyote. Antwan is curious about the lives of domesticated dogs, and when he meets Buddy and is invited by Buddy to switch places with him, his curiosity gets the best of him, and he hilariously learns how to be dog. Antwan becomes the new family pet, sharing the house with Buddy and Miss Betty- a showdog. In return for lessons on being a dog, Antwan agrees to teach Buddy how to be wild and to introduce Buddy to Antwan's pack. This story shines because of the fast and funny dialog between characters. It's wonderful on audio with the entertaining accents done by Neil Patrick Harris. Antwan calls Buddy "homes" and runs with a gang called the "wild diablos"- he exudes coolness. Buddy is the stern ex-dog star, Miss Betty the elegant, stuck-up show dog. The best character reading had to be Lola, the show cat Miss Betty talks Antwan into cat-napping, instead of eating...she is read as a valley-girl-talking aspiring actress, and it is just hilarious. Antwan is accepted in the family as "our Timmy", Buddy becomes more depressed at being the over-the-hill dog star and Miss Betty comes up with a plan to cheer him up. The plot and adventures get all tangled up in good fun. All my kids, ages 7 up to 14 loved this book, they begged to continue listening everytime we got into the car. -One warning, the *b word is used twice, in referring to a show dog- it's done in a technical, matter of fact way, not meant to be used as a bad word at all- but it might startle you if you don't know it's coming. My kids don't realize at all that it is used in a bad way, so it did not cause any comment with my bunch. -just a warning. love this story, give it a 5 stars out of 5 stars.